We will now go through the process of getting the track information from your various CDs. If all your CDs are already in the Playlist Manager, then skip to page 3. 1. Go to the Playlist menu, and click on Edit Active Playlist. 2. 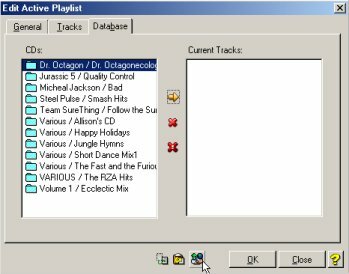 Click on the Database tab, then click the CD icon at the bottom of the screen to retrieve the Playlist information from the CD. 3. Select the drive and hit Continue. If there is no Playlist Information on the CD, then the program will access the Internet database for the CD information. Note: If your CD does not contain Playlist information (CD Text) and is not found in the Internet Database, then you will have to enter the information in the Playlist Manager. See Creating Playlists from Scratch for more information. 4. Your CD Playlist should now be entered into the Database. Eject the CD and repeat steps 2-3 for all your desired CD's.